I started working with Swiss balls back in the late 80s (when I had a lot more hair! ), then quickly began integrating them with weight training. 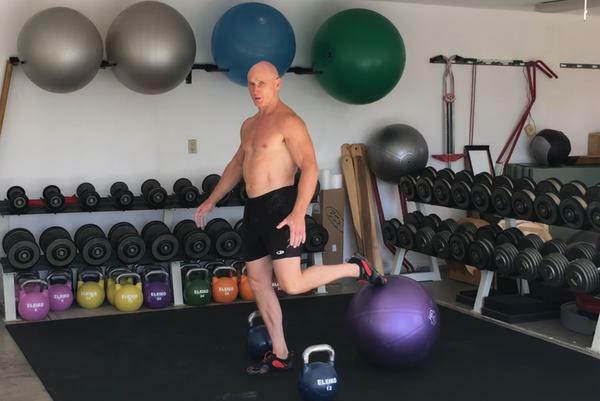 This time, I want to show you how to perform the Swiss ball lunge, a fairly advanced exercise particularly from a balance perspective. Be mindful that if you can’t balance well on one leg or are unable to kneel on a Swiss ball, take your time to work gradually toward performing this exercise. For this video, I’m performing the Swiss ball lunge just with my body weight. Be sure your positioning is solid. Don’t be too close or far away from the Swiss ball you’re using. Place the tips of your toes of either foot right in the center of the Swiss ball. If you don’t, the Swiss ball will begin to roll away as you move downward. It’s important to maintain an upright posture too. The tendency for many people is to let their trunks move forward which overloads their backs. That can be a real problem and bad form, especially if you’re using weights. A good way to avoid this problem: Pretend you’re balancing a bean bag on your head while you’re rolling the Swiss ball back with your toes as you begin to kneel and keep your trunk upright. As you begin to stand, remember that the Swiss ball will be unstable and your tendency will be to use your front leg almost exclusively. The real challenge for you is to learn how to stabilize, not only your body and the Swiss ball, but to use your back leg to distribute some of the work into the other leg. Once you’ve mastered positioning and stabilization and both sync up with breathing deep from your diaphragm, then you can work with weights like kettlebells that are very balanced and easy to grab. You can find more of these kinds of exercises in my Strong N Stable and Gym Instructor DVD sets.